The Notebook has ruined me for any other romance movie starring Rachel McAdams. I knew going into it that expecting a Nicholas Sparks type movie was a bad idea, but I couldn't help it. 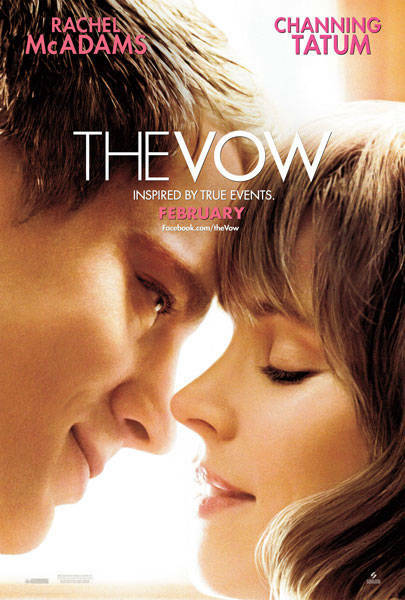 You need to know that The Vow is based on a true story. If you have ever seen a movie based on a true story you will know that real life is not* The Notebook. The Notebook was perfection…real life never is. The Vow is the story of a married couple who get in a car accident. The wife suffers head trauma which leads to a 5 year period memory loss. She doesn't remember her husband or anything about her current life, which is drastically different from the life she had before she met him. The base of the story is great…but I found that the movie itself kind of dragged. I kept waiting for the big moment…it never came. It was definitely an endearing movie and some people will probably love it, but, as I knew I would be, I was disappointed. I think we could have had more from Channing Tatum in the form of sadness for his wife not really being his wife anymore. He didn't have a huge breaking point that he could have had. You felt bad for him, but it kind of seemed like he cared, but not enough to really try. Rachel McAdams was great, obviously, but I thought she could have done the two personality thing better. All in all it will do its job of being the go-to chick flick for Valentine's week. It won't have the staying power in the chick flick department. People will see it this week and by this time next year you will have forgotten about it. Just like that women forgetting her life. *The Blind Side is an exception to the rule that 'based on true stories' movies are lackluster.